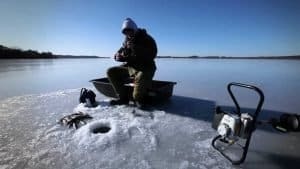 This article will give you the 411 on ice fishing and will help you in choosing the best ice fishing rods in the market. While some people love the idea of the cold, there are those who remain unexcited due to the thought of not having anything to do in this season. After all, the roads are covered in snow, lakes are frozen, and the temperature gets a little too unbearable. People have come up with activities and hobbies to make the best out of the cold weather. One activity that has grown immensely popular during the winter season is ice fishing. There is fishing. And there is ice fishing. Imagine sitting on top of a frozen lake and enjoying the cold breeze with a rod in hand and the line hanging inside an opening. This is ice fishing. 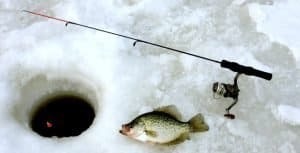 Ice fishing is catching fish in a frozen body of water through a hole. What sets it apart from fishing in an ordinary day is that you make use of the opening in the ice rather than having the entire water all to yourself. Those who cannot bear the cold need not worry as ice shanties and shacks are available. These are for anglers who prefer ice fishing in an enclosed area. In parts of North America, ice fishing is treated as a social activity. In other countries, it is seen as a form of contemplation. It has also grown to become a popular sport. As a matter of fact, there is a worldwide competition for it. Anglers from around the world gather to participate in the World Ice Fishing Championship–an established sporting event that was created for the love of ice fishing. Truly, ice fishing is the best cure for fisherman’s winter blues, but it can also be a fun activity for those who are yet to try it. It can be a great past time for anyone and everyone in the cold winter weather. Beginners and even those who have little to no experience of fishing can definitely try ice fishing. After all, outstanding casting and angling skills and abilities are not necessary in this activity. It is less competitive compared to other forms of angling with a more laid-back approach in catching fish: you prepare your rod, drop your line, sit back and wait for your catch. Even so, great ice fishing gear is needed to be able to yield good results in your ice fishing session. To be able to achieve the best ice fishing experience, one must have the proper gear. The simplest and most important necessity when fishing is the rod. Although ice fishing is quite similar to other forms of angling, there are unique and specialized ice fishing rods built for this activity. Popular fishing magazine In-Fisherman agrees that ice fishing rods have truly come a long way. 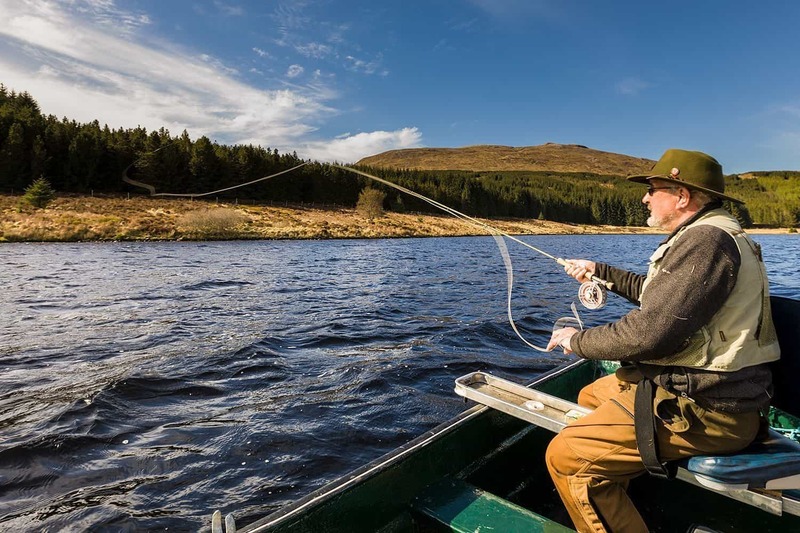 Gone are the days when anglers make do of sticks with pegs for wrapping fishing lines. Through the years, fishing methods and equipment have greatly improved together with the evolution of ice fishing itself. At present, there is a wide range of ice fishing rods in the market that varies in length, material, action, and the like. Different brands have tailor-fitted their products to the demands of fishing enthusiasts. There is an ice fishing rod available for all kinds of needs and wants. You just need to determine what you like and need. Once you have details in mind, you may proceed in choosing the best ice fishing rod for you. You have to weigh both your need and preferences. Before we discuss in detail the items to be factored in, we have listed below our top picks and the best ice fishing rods in the market for your consideration. A top-of-mind product when it comes to ice fishing, the Shakespeare Ugly Stik GX2 Ice Fishing Rod is our most recommended rod for fishing in the cold. This rod is one of the most known and well-loved ice fishing rods in the market. Quite contrary to its name, the Shakespeare Ugly Stik GX2 has been proven to yield beautiful results in terms of fish catch. As a matter of fact, it ranks 8th in Amazon’s Best Sellers list for Ice Fishing Rod and Reel Combos. The Shakespeare Ugly Stik GX2 is part of the new generation of the famous Shakespeare brand. It lives up to the Ugly Stik name as it combines heritage and tradition with strength and durability. Made of a blend of fiberglass and high modulus graphite, the Shakespeare Ugly Stik GX promises durability and sensitivity even in the harshest weather. Because it has more graphite material than the previous models, there is increased sensitivity which helps you detect nibblers. It is equipped with a strong and equally sensitive fiberglass tip which translates to clean hook sets. This rod sports dual EVA foam handle grips that remain good even in wet conditions. The handle is lightweight, durable, and easy to clean. On top of that, it has a twist lock reel seat and a 20-size spinning reel with a ball bearing that is made of ported aluminum spool. Maximum strength is guaranteed with guides made of stainless steel. This rod is compatible with monofilament, fluorocarbon, and braided lines. This ice fishing rod comes in different models with a variation in size, length, guide count, and power. With its wide range of models, you can choose an ice fishing rod that matches your desired catch. Its smallest size is 26 inches while the longest is 30. The Ugly Stik GX2 is definitely an upgrade that has better balance, improved components, and a sleek design. The Shakespeare Ugly Stik GX2 is far from ugly and is definitely our top recommendation when it comes to ice fishing rods. With a good variety of models, you have the option to choose the best ice fishing rod fit for you. This rod will surely give you a wonderful ice fishing experience may you be a beginner or a professional. A new addition to the St. Croix line of high performance ice fishing rods is the St. Croix Legend Black Ice Fishing Rod. Although quite pricey compared to its contemporaries, you will get your money’s worth with this ice fishing rod. This rod meets all the needs and even the wants of a hard-water angler. The St. Croix Legend Black Ice Fishing Rod may be one of the finest and most sensitive ice fishing rods of all time. Released in 2017/2018, this rod outstands its predecessors which are the Legend Silver and Gold. Sporting a tactical black look, this rod has a sleek design but still retains the feel of classic silver. It boasts of excellent performance with its solid carbon blank and precision tapers. Each rod is equipped with a Sea Guide® PNPS reel seat for hand-to-handle comfort and minima guides made by Pac Bay. With its adjustable and interchangeable stainless steel strike-indicator system, fish catch of any specie is no problem. There are 10 models in this series with each offering a different length and power. The shortest rod is at 17 inches with light rod power while the longest is at 48 inches with medium rod power. Another plus for the St. Croix Legend Black series is its high quality 1-year St. Croix Superstar Service warranty. If you are looking for a comfortable and sensitive ice fishing rod and you have enough money to spare, we suggest you get the new St. Croix Legend Black Ice Fishing Rod. It has components made by equally outstanding brands Sea Guide® and Pac Bay. Despite its hefty price, it guarantees quality and good fish catch and ensures a wonderful ice fishing trip. Another rod which you may come across when talking about ice fishing is the Berkley Lightning Ice Rod. Berkley is a brand known for its quality rods and this one does not disappoint. It has proven its reliability having placed 11th in Amazon’s Best Sellers list for Ice Fishing Rod and Reel Combos. The Berkley Lightning Ice Rod is made of fiberglass and is responsive, lightweight, and durable. Comfortability is one of its top priorities with a cork grip with that is easy on the hands and gives anglers warmth. Its fore grip also has a hidden thread technology which helps in reducing finger wear and tear. It has an ultralight graphite spinning reel with a ball bearing that is 20 in size and is made of ported aluminum spool. Because of its skeleton reel seat, there is an increase in sensitivity and a decrease in weight.The cork grip and minimalist reel seat work together to provide the angler with much sensitivity to even feel the lightest fish bites. Another good feature is that the guides for this ice fishing rod is made of special stainless steel which is 55% lighter and 20 times rougher than aluminum oxide. These guides are good for the cold since they are big and do not freeze easily. There is a lot to choose from with the Berkley Lightning Ice Rod when it comes to sizes and actions. It has sizes from 24 to 32 inches which provides medium to heavy action. You will never go wrong with the Berkley brand and the Berkley Lightning Ice Rod proves this further. It does not compromise comfort for durability and is a good find especially that it comes at a reasonable price. You will have no regrets with this purchase. Fenwick has been in the fishing tool market for so long that people associate it with quality. Included in our picks is the brand’s offering for ice fishing–the Fenwick Aetos X-Fast Spinning Ice Rod. This rod is surely of quality that it is included in Amazon’s Best Sellers list. The Fenwick Aetos X-Fast Spinning Ice Rod is best described by its top characteristics–maximum strength, minimal weight, and sensitivity. This rod is made of 100% carbon fiber and has high modulus blank construction. It has a hidden handle design with carbon fiber hoods and split cork grips that have technically advanced construction. Aside from these wonderful features, it also has Fuji skeleton reel seats and titanium frame guides with lightweight titanium inserts. The rod’s titanium parts help reduce line friction and make the product last longer than it should. Overall, this ice fishing rod is durable even with the coldest conditions at hand. There are 3 options to choose from for this rod, the shortest being 25 inches with ultralight rod power. Meanwhile, the longest at 30 inches gives you medium-heavy rod power which is good for fighting fish. The Fenwick Aetos X-Fast Spinning Ice Rod has a quality build that offers durability but still remains lightweight. It is versatile and can be used in different fishing conditions. Its qualities result to good fishing performance and the price won’t hurt your wallet so you should definitely consider this ice fishing rod. Though the last on our list, the Frabill Fin-S Pro Ice Fishing Rod is definitely not the least in terms of quality. At an affordable price, this ice fishing rod has a lot to offer. The Frabill Fin-S Pro Ice Fishing Rod has sensitive detection thanks to its solid fiberglass composition and solid carbon fiber blank that goes through the handle. It has a reel seat with cork grip, 3 plus 1 ball bearing reel, and special stainless steel single foot guides. With a cork handle, this rod’s grip is sure to be comfortable and durable at the same time. This ice fishing rod comes in 4 models with ultralight and light rod power. Panfish models of this rod include sensitive micro spring bobbers. It comes in two colors, black and silver, for a sleek feel. The Frabill Fin-S Pro Ice Fishing Rod gives you value for your money. It is packed with quality materials, thus, it is long lasting so you need not worry about getting a new one after a couple of uses. Durability and quality performance is guaranteed. Because there are numerous rod choices for amateurs and professionals alike, choosing the best ice fishing rod can be a difficult task. To make picking a rod easier, you need to narrow down your choices. To be able to do that, you need to determine your needs and preferences. You need to know what your goals are for you to determine what you need to achieve those goals. That will leave you with a narrowed list of rod options. You can pick a rod based on your preferences from there. Although this may sound like a complex and tedious job, it will be a breeze once you get the hang of it. We have listed below aspects and qualities that you need to factor in when choosing the best ice fishing rod for you. The most important quality to consider when choosing your ice fishing rod is the rod power. To put it simply, rod power is the force needed in order to bend the blank. There are specific rods made to catch certain species of fish. By knowing what fish you are aiming for, you will be able to determine the rod power needed to be able to get your desired catch. Rod power ranges from ultra-light to ultra-heavy. Ultra-light ice fishing rods are good for catching panfish, while light ones are for perch. Light to medium ice fishing rods are for walleye, whitefish, and trout. Heavy ones are best for pike and lake trout. You should always remember that the measures in determining the power of a rod differ from one manufacturer to another. There is subjectivity when it comes to this quality. Nonetheless, the rod power declared by manufacturers serve as a good guide in choosing the right ice fishing rod. 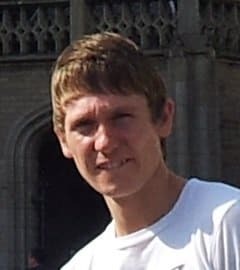 Next to the rod power, the action is another important factor to consider. It refers to where the rod reflexes along its blank. The rod action of an ice fishing rod varies from slow to ultra-fast. Slow action blanks have no sensitivity and strength. These blanks hardly detect catch and wrestling with your fish using these rods might be difficult. Medium and fast action rods are most preferred. The good thing about medium action rods is their ability to absorb shock from hooksets that are over exuberant. Fast and ultra-fast action rods have limber tips and very good strength. While brands usually label their ice fishing rods with the corresponding rod action, there is a way to check this quality. For meticulous anglers, checking rod action is no sweat. You just simply take the handle in one hand, and the tip in the other. In that position, you try to bend the rod. That will help you confirm the action of your chosen ice fishing rod. The material that your ice fishing rod is made of greatly contributes to its overall performance. Thus, you should check the blank material of a rod before deciding to buy it. There are different materials available in the market–graphite, fiberglass, and composite blends. Graphite-made rods are pricier but there is assurance of quality. Solid graphite blanks are known for their sensitivity. These rods have fast sensitive tips and backbone that is great for battling with large fish. They are also lighter in weight. Fiberglass is another good material for ice fishing rods. Although they are not as sensitive as graphite rods, they have better flexibility and thus, bend more. This quality is perfect for smooth hooksets. If you have more than enough money to spare, you may opt to buy ice fishing rods made of high-end fiberglass. These rods will give you a bang for your buck. As a matter of fact, these expensive rods are of far better quality than those made of graphite. The part of the rod that comes in contact with the angler the most is the rod handle. It is what you will be holding the entire time during your ice fishing session. That being said, your handle should provide you with utmost comfort and convenience but still give you the grip needed for your desired catch. Rod handles can either be made of plastic, foam, and cork. Plastic handles have poor sensitivity which might be an inconvenience when ice fishing. Foam handles are very comfortable yet they absorb water and liquids. Cork, on the other hand, is most recommended. Rods made of cork have good vibrations and are also good at keeping warmth. Professional anglers prefer these handles. Both the quality and quantity of your rod’s guides or eyelets determine how good your ice fishing rod is. The more eyelets your rod has, the more impressive its performance will be. Rods with 4 guides are good, but if you can find ice fishing rods with 5-6 guides, it would be much better. The ideal ice fishing rod has guides with sizes that taper towards the tip. It is also good to have larger guides since these take less time to clean. Not only is it easier to maintain but it also translates to better fish catch. How long your ice fishing rod is should be a deciding factor in taking your pick. In choosing the perfect length for your ice fishing rod, you must take into consideration your preferences and the conditions at hand. Short ice fishing rods usually range from 26-28 inches. These rods are suitable for ice fishing in enclosed spaces. Since they are shorter in length, you don’t have to worry about your rod hitting the ceiling of your shack. Most ice fishing rods in this length are made of graphite. The downside to choosing shorter rods is that there is the need to exert more force. In return, it takes a toll on the angler’s arms. You, as the angler, will be enjoying less time ice fishing because of the stress you will be getting while using these shorter rods. In contrast, long ice fishing rods are good for anglers want to spend more time wrestling with big fish in deep waters. These ice fishing rods are usually no longer than 38 inches. Rods that are long are best used with powerful hooksets. The disadvantage in using these rods is that it takes too much space. Some anglers do not want to use these rods when they are indoors. Aside from considering the parts and qualities of an ice fishing rod, you must also take into consideration the conditions in which you will be fishing. In ice fishing, there is a choice to go inside or outside. Ice fishing inside, on one hand, involves staying in an ice shack or hut. There are anglers who prefer staying in enclosed spaces when fishing, thus, ice shacks and huts have become popular. Ice fishing outside, on the other hand, involves sitting outside exposed to the cold. There are no walls to keep anglers warm. 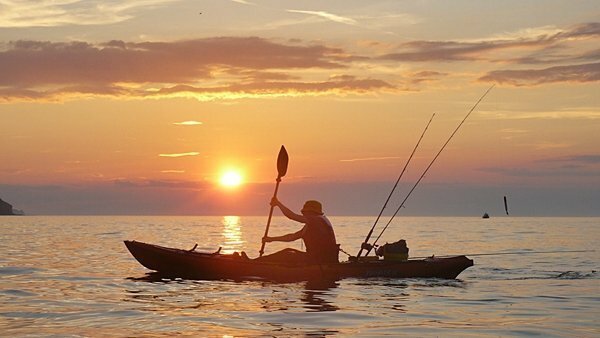 Special outdoor equipment and apparel are used to maintain heat and give comfort to anglers. These conditions at hand have a say on the type of ice fishing rod you will be using. For example, some people prefer shorter rods for ice fishing indoors because of the area. There is less space to move around and shorter rods may be ideal to avoid unwanted accidents and incidents to happen. Quite the opposite, longer rods are good for ice fishing outside where you have limitless area and space to go fishing. You may use these long rods in battling with heavy fish without worrying about hitting or bothering those around you. Equipment that serve as supplementary to your rod also bear different results when used indoor or outdoor. This is why you should know and consider the situation and conditions of your fishing adventure. To help you further in deciding which ice fishing rod to choose, we have posted below a video with ice fishing professionals discussing their rod choices when they go ice fishing inside versus outside. Ice fishing is a one of a kind experience and to get the best out of it, you need specialized equipment. The market is filled with both affordable and expensive ice fishing rods and choosing the best one might be a big dilemma. You must factor in several aspects and conditions to get the most out of your purchase. With all the things listed in mind, you will find it easier to narrow down your choices of ice fishing rods. 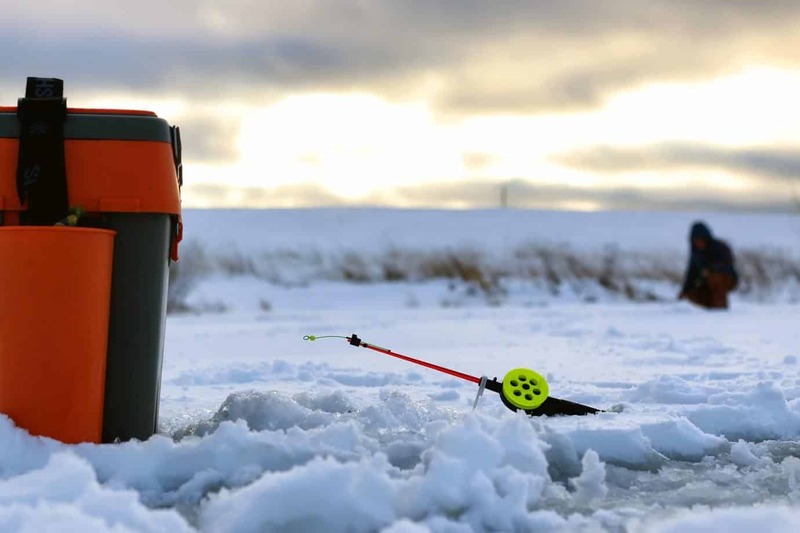 Different brands offer different products which result to different ice fishing experiences. You must always remember that no rod is the same. Technicality aside, you must also greatly consider your preferences because a good ice fishing experience happens when there is interaction between you as the angler and your ice fishing rod.